Development of the A-20 tank started at Kharkiv Factory No. 183 in December 1937. The project was a further development of the BT-7 tank and became a predecessor of the legendary T-34. Work on the vehicle was led by Mikhail Koshkin. On May 18, 1938, technical characteristics of the tank designated BT-20 were approved. Only a few experimental prototypes, with a wheeled caterpillar suspension, were built for training purposes. the A-20 is a difficult tank to play, suffering from bad armor, and as such has been buffed in recent patches. At high speeds it also suffers small maneuverability losses. In order to succeed, the A-20 must be played passively, and as a scout. It leads to the much improved T-34. Above average engine power, top speed, and traverse speed. On paper, the A-20 seems to be a perfectly fine Tier 4 light tank. It has a decent gun selection for Tier 4 (although the T-46 receives the same weapons one tier earlier), and it seems to have a very high top speed and good hull traverse. The A-20's mobility statistics are a lie, for one. It has a tendency to bleed an incredible amount of speed on turns, and its acceleration and maneuverability are nowhere near as good as other lights. Active scouting (running about and dashing from cover to cover, spotting enemy tanks for your team) is very dangerous, and requires a lot of skill and forethought. However, the turning radius and speed are surprisingly tight, much like the BT-7. The A-20's view range is disappointing for its tier. In addition since it is a light tank, there is a camo bonus. It is recommended to run optics/binoculars and camo net. Firepower-wise, the A-20 doesn't really have much to complain about. The stock gun, the 45 mm 20K, and the 37 mm ZiS-19, which were previously used on the Tier 2 BT-2 and Tier 3 BT-7, are excellent and mediocre on those tanks, respectively. At Tier 4, they are completely useless, and should be gotten rid of as quickly as possible. There are three viable weapons. The 37 mm Automatic SH-37 is, as the name suggests, a clip-fed autocannon. It is good enough to kill lightly armoured tank destroyers and light tanks, but little else. However, with premium shells, it offers good damage per clip. The 45 mm VT-42 offers good accuracy, rate-of-fire, and aim time, as well as fairly good penetration (for Tier 4) in exchange for low alpha damage, making it one of the more well rounded guns of the 3. Since it carries over from the BT-7, A-20 drivers who use this gun will feel right at home. The 76 mm L-11 is the complete opposite, with terrible accuracy and aim time, low rate-of-fire, but good alpha damage. It works better at close ranges. Against Tier 4 and 5, the A-20 can still do some damage. Unsurprisingly, since it is a light tank, the A-20 has no armor to speak of, and despite the good sloping, it should never rely on its armor to save it from enemy fire. The 37 mm ZiS-19 and 45MM VT-42carry over from the BT-7, and the 37mm SH-37 Automatic from the T-46. The SP-3 turret is absolutely necessary for the all-important increase in view range, and is also needed to mount the more advanced guns. The V-2-34 engine provides a small, but not very significant, increase in horsepower, and is also used on the T-34. The 37 mm Automatic SH-37 can be researched next, or may be skipped entirely if there is no intention to use it. Once it was realized that the BT tanks didn't have sufficient armor or armament, a new design was developed for a fast medium tank. In 1937, the Kharkov factory was ordered to design a new tank, and the design work started in November 1937. The chief designer was Mikhail Koshkin and his deputy, Alexsandr Morozov. Design features The A-20 had sloping sides and a small angular turret with 25mm of armor. The tracks could be removed and could be run on just the wheels. The chassis itself was based on the BT-7M. The hull had a V-shaped glacis plate and was angled at 60°. The A-20's hull also overhung the tracks with the sides angled at 25°. In 1939, a 76.2 mm gun was installed and the vehicle was designated as the A-30. This was the same gun that was installed in the BT-7. There was an attempt to place a short barrelled 76.2 mm gun in the A-20's turret, but it just didn't work, as the turret ring couldn't absorb the recoil. Prototype In May 1938, a wooden model of the A-20 was shown to the Defense Council of the Soviet People's Commissars (Soviet Narodnykh Komissarov, or SNAKE). Some didn't like the wheel / tracks feature carried over from the BT series, and Koshkin said it added weight that just wasn't necessary. The design had a 45 mm gun, which Koshkin said should be replaced by a 76.2 mm gun, as it was inadequate. Stalin was at this presentation and ordered that the Kharkov factory build not only a full-size prototype of the A-20, but also make the requested design changes and build a prototype that would be designated the A-30. In August 1938, the High War Council, let by the People's Commissar for Defense, K. J. Voroshilov, discussed the A-20 and T-32. Many on the Council disliked the T-32. In July 1939, the Kharkov Locomotive Factory had completed the prototypes for the A-20 and T-32. They were both then tested and it was decided to go with the T-32. On December 19, 1939, the People's Commissariat Fx%�Defense released the T-32 to the Red Army. It was soon designated the T-34. 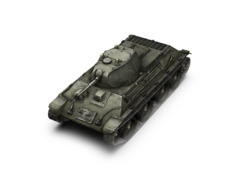 In 1939, tests were conducted with the T-32 and A-20: the T-32 was selected as it had better fire power and armor. This page was last modified on 11 May 2016, at 15:26.